Howdy and how is your week going? I am still waiting for a nice sunny morning to wake up to instead of gloom. There is just something about waking up to sun streaming in. I have seen on the news that the northeast is burning up and we are really quite comfortable. I was excited to see the sun return today and it was gorgeous out. 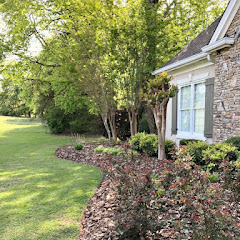 I was able to get all the much needed yard work done. I also was expecting painters today, but no. They are behind because of the rain and now I am on the schedule for next Monday. 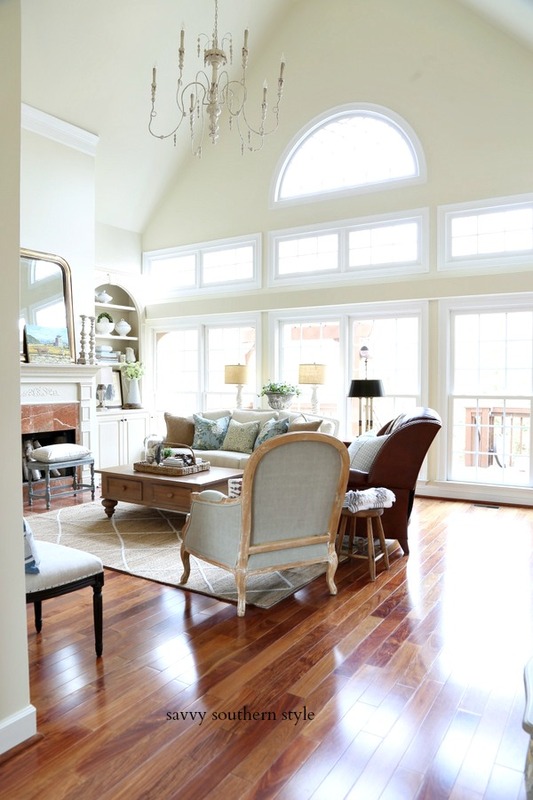 We took everything down off the walls and anything else that would have been in the way and it is all in the dining room, sitting room, master bedroom and breakfast room. Grrrr, now we have to live in this mess for another week and I don't like a mess. Anywho, moving on. Great turn out last week and some wonderful inspiration and tips were shared. Here are just a few. 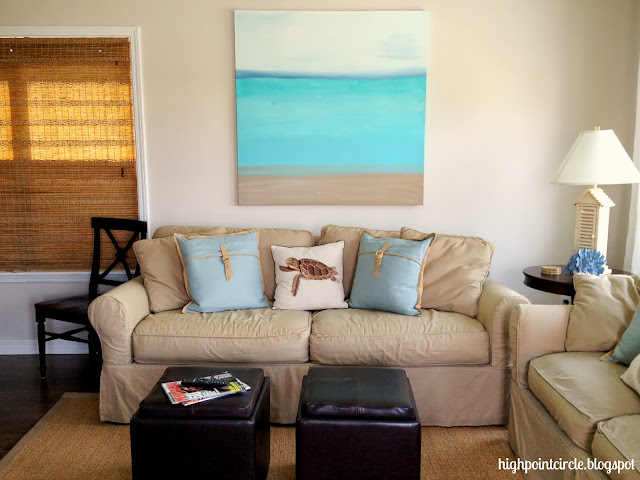 This repurposed canvas art by Highpoint Circle popped out at me since this is sunny and bright. 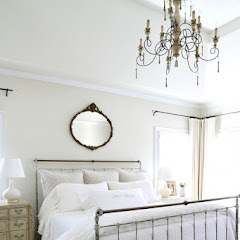 Such a cute room. 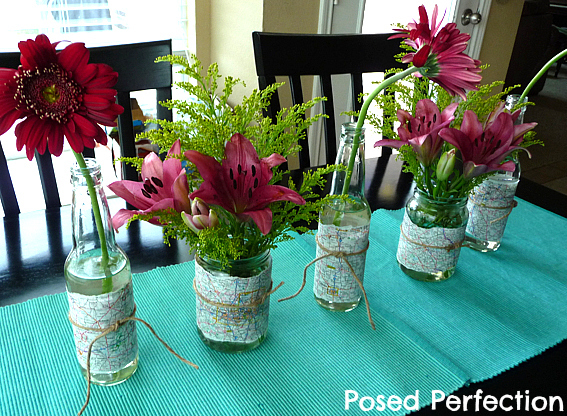 Posed Perfection shared these cute road map wrapped bottles and jars. This crayola art is a unique idea and was shard by The Old Fat Hen. Would be perfect in a child's room or play room. 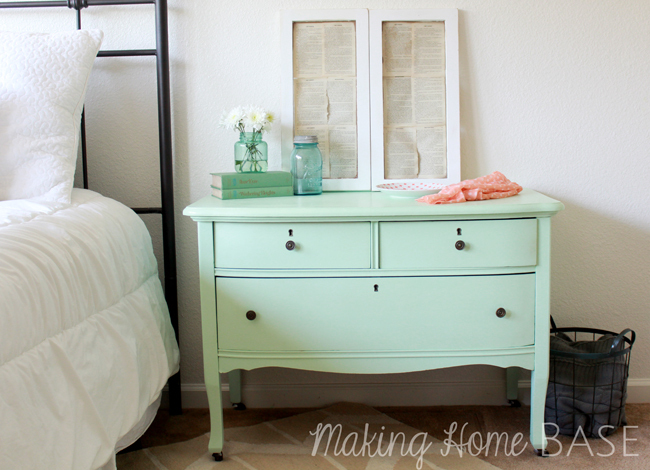 Love the fun mint color of this nightstand by Making Home Base. 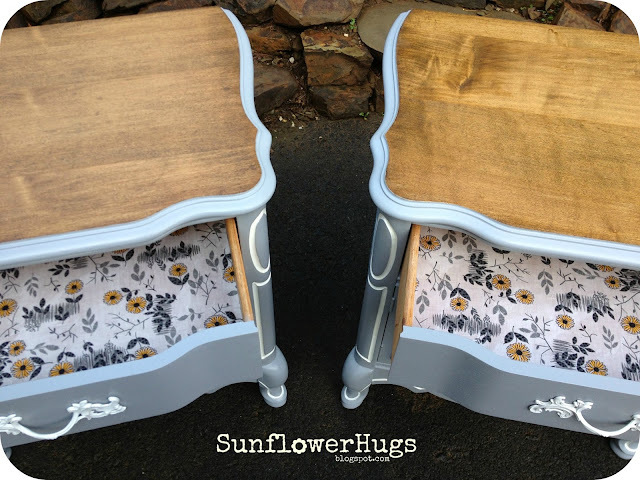 Great new look for this pair of nightstands and I love the cute paper added to the drawers by Sunflower Hugs. This retro desk and chair are so fun in this color and fabric shared by Restyled Vintage. You can't eat these, but these twine cupcakes sure are cute. 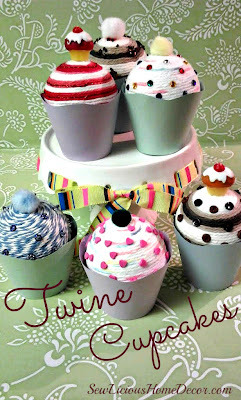 Find out how to make them at Sew-Licious Home Decor. Practical Stewardship shared this healthy dish. I need to make this with some of our fresh tomatoes. Thank you for hosting Kim. Have a wonderful week! Thanks for the party, Kim. I've been away for a while. Happy to be participating this week. Great features, as always. Wonderful features Kim! I'm happy to see the sunshine today, thanks for hosting! Hi Kim...Thank you so much again for another super party! I hope you are enjoying a lovely summer. Thank you so much for taking the time to host each week! Love all the features you presented!...Thanks for hosting Kim!!! What great features Kim - loving that crayola art by Dee!!!!! Thanks for hosting week after week, Kim! How upsetting that the painters didn't arrive >:( I hope your week flies by. Thanks for the party! Great features Kim! I am intrigued by the fried green tomato sandwich so I will have to check out that recipe. I have plenty of green tomatoes! I'm with ya! So good to see some sunshine today! Hope you have some more of those wonderful sunny days. Thanks so much for hosting an always great party!! Thanks for hosting, Kim. Sorry you are in a holding pattern for your painting. I know that can be a pain. Just think how gorgeous it will all be when it is finished! A big thank you for featuring my Road Map Wrapped Jars. What a fun surprise! I hope your week goes well. Hi Kim, love the jars wrapped with the maps and the food looks so delicious! Happy to be joining the party. I dropped by Eleanor Brown. Nifty! I'm WOWed! Those Sunflower Hugs nightstands had me at hello! Thanks for hosting, Kim! Glad you finally have a little sunshine :o)Thanks for hosting the party! That spaghetti is making me hungry Kim! Thanks for hosting! Very pretty and unique features. Thanks for hosting! Thanks for hosting again, Kim! Love the features, that Crayola art is amazing...love it! Have a great week! Thanks so much for hosting, Kim. Love those nightstands by Sunflower Hugs! Very pretty and lucky features to be chosen! Thank you sweet lady for the great party! Hope you're having a lovely Summer. hi Kim, thanks for the fabulous party as always! I saw on Facebook about your painters. I don't like messes either, so I would be torn on staying messed up or putting it back and tearing it apart again! It seemed as if we had rain for months. It is so depressing. We have finally had a couple weeks of mostly sunshine, but the field behind us still has standing water. Now, we have the heat...but at least it isn't gloomy every day. I am fascinated by the crayon art. I have no place to put something like that...but it intrigues me! Great features. That bruschetta spaghetti looks so fresh for a summer dinner. Thanks for hosting. Hope your painters show up sooner than later. Woo hoo! 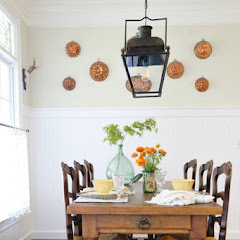 Thank you for featuring my French Country tables!! Awesome features ~ Thanks so much for hosting Kim!! wow...these features are awesome...such talent out there. Beautiful features, thanks for hosting! Thanks Kim for a great party! Hope to see you at Haven! Hi Kim, thanks again for hosting a great party! Hope you're having a great week! Glad to get a bit of your rain! I hope you get more of our sunshine. That sandwich looks pretty good! Thanks for hosting, Kim. Hope you get your painting done soon! Hi Kim, I popped in here to add my latest project to your party, was scrolling down and my green and white Retro Desk caught my eye - thanks so much for featuring it, what a lovely surprise! Thanks so much for featuring my Bruschetta Spaghetti, and thanks for hosting this great party! Lovely features, and great new links! Thanks for hosting, as always! Great features! The green tomato sandwich looks delish! Thanks for hosting! Thank you so much for hosting. Great features. Thanks as always for hosting and making the midweek a little more fun! 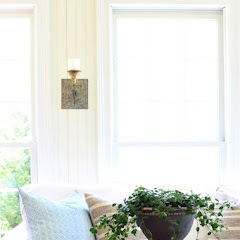 Thank you for hosting - your linky party looks great and the features were fabulous! Great features, as always Kim! Thanks for hosting! Kim~Thanks so much for hosting this lovely party. This is my first time linking up. I am just poking around your site and I love it. You also have so many wonderful bloggers linking to such creative ideas. So happy to have found you! Kim, your so gracious to feature my Greenbrier Fried Green Tomato sandwich. Thank you!! I have been so preoccupied with other things this week that have taken presidence and just now checking my blog. Kim - thanks for hosting and love that color mint on the dresser. It's just perfect isn't it? Thank you for the awesome party! Always full of inspiration. It's been a long time since I've had time to party! In fact, yours is the first one I have attended in about a year (yikes!!). So, thank you for continuing to host these week after week! 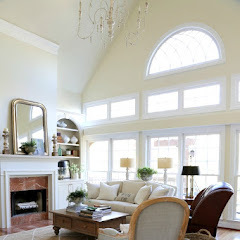 I am getting back into the grove and I'm happy to share my own home staging colors today! P.S. We just moved, so I know all about messy spaces! I am really late to the party this week!Great features Kim! Thanks so much for hosting! Great features Kim. I have some projects coming up that hopefully I will have something to add to the party soon...lol. 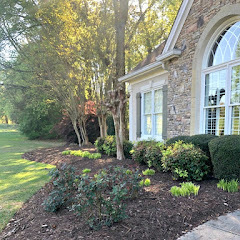 Hey KIm, just linked up my Incomplete Home Tour, hope you will check it out. Thanks for hosting this great party every week. Have a good one! I view your party each week and enjoy it immensely! I am pretty sure that this is my first time to join! Thanks for hosting! THANK YOU FOR HOSTING KIM, SORRY ABOUT THE WAIT ON YOUR PAINTING,I CAN'T WAIT TO SEE THE FEATURES NEXT WEEK, I JUST SPENT 1 1/2 HOURS BEING LOST IN THE SUBMISSIONS SO FAR AND AM COMPLETELY BLOWN AWAY. Fabulous features Kim! Thanks so much for hosting! It's gorgeous out here in California, too...just counting my blessings. I need to get outside though. Is it just me or doesn't it seem like everyone's photography has gotten so good??? It's fun to see the projects AND the nice photography. Oh be still my heart! Thank you so very much for featuring my painting! It means the world to me that you like it. I'm late to the party this week! Thanks so much for hosting, Kim! This is my first time posting here. Thanks for hosting! Hi Kim. Looks like I might be the official last party guest. Do I get a special prize for that? Thanks as always for a great party.